This Aicok glass kettle brings up to 1.7 liters of water to a rolling boil in a matter of minutes. Other highlights including temperature control, keek warm, a stay-cool nonslip handle,a concealed heating element to prevent mineral buildup, a drip-less pour spout, and boil-dry protection with auto shutoff for safety. The perfect kettle for all your needs. 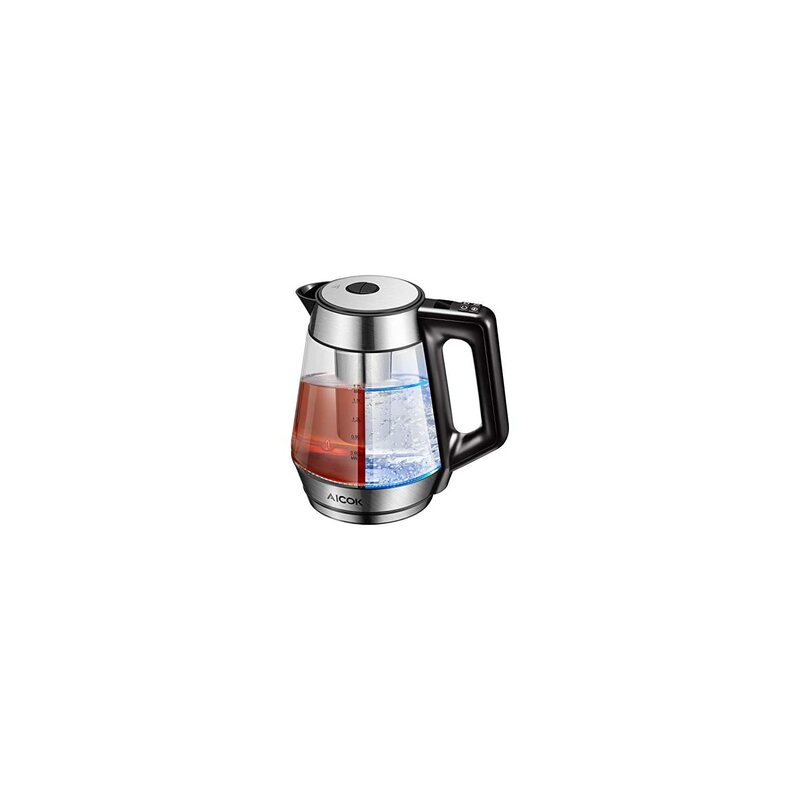 A perfect electric tea kettle for all your brewing needs! Here are some temperatures suggestion for you. Temperature Control Function – This Glass warter boiler with adjustable temperature function.Variable temperature control from 104 Fahrenheit to 212 Fahrenheit.Each teim you press the PROG button, the temperature will increase 10°F. Keep Warm Function – This tea kettle with 2 hours keep-warm function, your water is ready whenever you need it. After 2 hours it will automatically turn off, this can help to save energy. LED Display – The electric water heater with a LED display. Digital control Handle with LED display lets you know the temperature you set,so that you can operate it according your demand. Extra Safe – BPA Free.British Strix Controller with Auto Shut-Off & Boil Dry Protection makes it safe and convenient to use,you won’t have to worry about this glass kettle scalding your hands or getting burned. Our kettle is 100% BPA Free and will not contaminate liquids. Fast Boiling, Blue LED Indicator, 2 years warranty – This electric tea kettle can meets all the needs.1500W power allows the water to boil in 5-6 mins.We offer 2 years warranty, any question, please feel free to contact us.